According to FIFA: They have us ranked 11th, Spain 1st, and France a whopping fall to 21st. And yet Egypt are 9th and didn’t even qualify for the World Cup. These rankings really don’t count for much except seedings, and they’re highly controversial, but it’s about what we deserve. The World Cup is over and the club season is just around the corner. Where to get your club news from? It’s finally over. The alleged football tournament known as the FIFA World Cup 2010 has ended, with Spain as winners. Somehow, it just didn’t feel… right. It was pretty underwhelming, and not just because we were terrible. The World Cup is just about over. 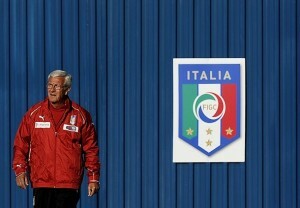 Come Sunday, we’ll have seen the last game of the 2010 tournament, one that was pretty forgettable for azzurri fans. The World Cup is nearly over (only 3 games left… and how bout them Germans? ), and normal posting will resume very shortly. Cesare Prandelli has had his first press conference as Azzurri coach today, making it really and truly official: The Lippi days are over. Italy boss Cesare Prandelli has explained what he wants from his prospective players at his official unveiling in Rome.